The news came, and the fires followed. On Dec. 9, sometime after 5 p.m., Britain's Parliament passed a bill to triple university tuition fees to $15,000. Within minutes, peaceful student demonstrations descended into chaos, and Parliament Square  home to Big Ben and Westminster Abbey  transformed into ground zero. Protesters broke through metal barricades and used them to smash windows at the Supreme Court. They urinated on a statue of Winston Churchill. And they scaled the Cenotaph  the sacred memorial to the nation's fallen soldiers  to rip down the Union Jack. 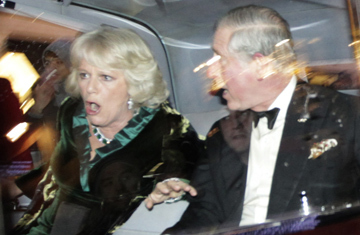 As the night progressed, a mob of 50 demonstrators  many wearing full-face balaclavas  attacked the car carrying Prince Charles and Camilla, Duchess of Cornwall, denting its doors and pelting it with paint bombs. To anyone standing outside Parliament, amid riot police, injured students and plumes of smoke, one thing became clear: London was burning. For students in the U.S., the widespread violence may be difficult to understand: $15,000 seems like a bargain compared with the $50,000 price tag of America's most expensive private universities. But until 1997, British students paid little or nothing to attend college because Britain's government footed the bill through the national budget. In 1996, though, Conservative Prime Minister John Major commissioned a report endorsing the introduction of means-tested, mandatory tuition. Since then, the cost of attending college has risen steadily, climbing from $4,700 in 2003 to $5,000 in 2009 for students from the wealthiest backgrounds. The decision to suddenly raise fees by 200% has left students feeling cheated. "In Britain we believe in free education as a social good for all, and education should be based on social values and have nothing to do with money and consumerism," says Daisy Jones, student union president at the Courtauld Institute of Art in London. "It should be a right for everyone." On the eve of the Dec. 9 protests, Jones, 25, joined demonstrators at a more peaceful event outside Somerset House, an arts and cultural center in central London. They sang protest versions of Christmas carols, like "Come, All Ye Bankers," to get their point across. Like many of her fellow students, Jones worries that the $45,000 price tag for a three-year degree program will discourage students from pursuing the arts and drive them toward subjects like engineering, medicine and mathematics, which often lead to more lucrative careers. And that, she says, could force schools like hers to shut altogether if they can no longer attract students. The government remains adamant that its proposals are actually fairer for all: schoolchildren who currently receive free school meals will have one year of tuition covered by the state. "[The new fees] will create a dynamic university sector that can compete with the very best in the world," Prime Minister David Cameron said during a speech in London on Dec. 8. "And because the rich will pay more and the poor will pay less, they will put fairness back at the heart of our university system." Given all the fires, students clearly don't buy it. Alexej Ulbricht, 23, a politics student at the University of London's School of Oriental and African Studies, worries that increased tuition fees will turn higher education in Britain into "a luxury that can only be afforded by those who are rich enough." Poor students already face a challenge. They lack access to the vast array of private grants and scholarships that students in the U.S. can tap into. At the moment, U.K. students in need of financial assistance take out government loans  which cover tuition and provide the option of a yearly maintenance loan  with nominal interest rates. They pay them back in monthly installments when their salary reaches $23,700. The increased debt they will face upon graduation will be particularly daunting for poorer students, who are less willing than their better-off counterparts to take on debt. In 2009, only 1% of students at Oxford and Cambridge were from poor homes. Amid the rioting in recent weeks, the government did make some concessions to ease the transition toward higher fees. Under the new system, which will start in 2012, students will not begin paying back their loans until their salary reaches $33,200  a nearly $10,000 increase over the current threshold. And from 2016, that threshold will increase every year to stay in line with inflation. Some students from poor homes will also be able to apply for grants. But for the students who have taken to the streets recently  and even for those who haven't  these concessions do little to numb their feeling that they've been betrayed. Jones, the art student, admits that the battle has been lost but suggests the war is only just beginning. Asked if she has a message for high school students, she doesn't skip a beat: "Keep fighting it, and we'll keep fighting with you."